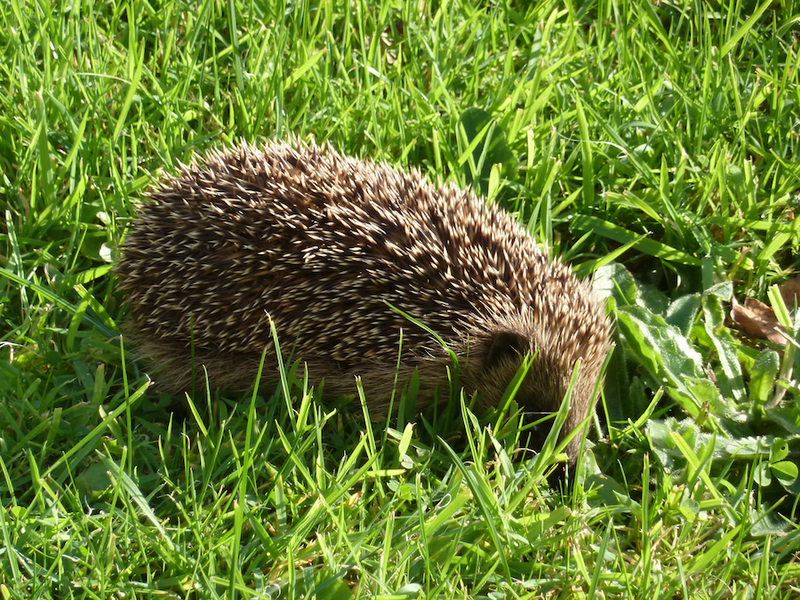 We Interrupt this Blog Silence…..
…..to bring you two pictures of a hedgehog. Mr Devine has cornered the market on big sky and cormorants leaving me with nothing to work with other than a hedgehog…. so there you go… if you stare at a blog long enough eventually something new will appear. But perhaps not what you expect nor want. 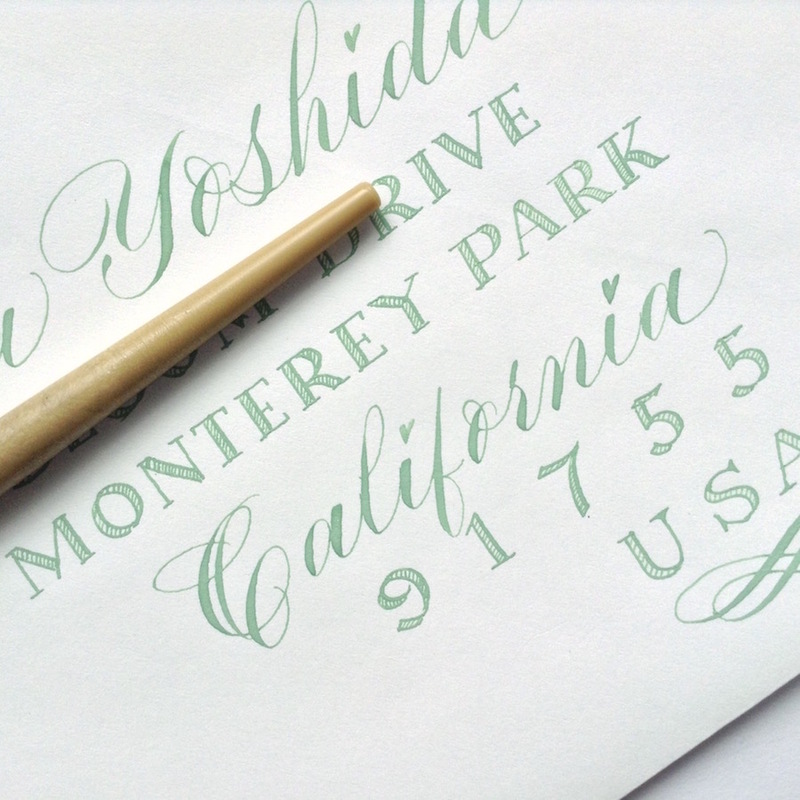 And for those keen on pen marks and calligraphy, some recent work…. I will now make Ye Olde Blogging promise about updating more frequently in future etc, etc… etc…. blah, blah, blah…. *sincere well meaning face on head that is furiously nodding*….. This entry was posted in Calligraphy and tagged blog promise, calligraphy blog, calligraphy envelopes uk, copperplate, hedgehog, modern calligraphy on August 15, 2016 by Scarlet. “Frosty Knickers” … – ? I like this crosshair dots, i-Punkt in German. Wonder whether apple will sue. Meanwhile…. i-Punkt the spelling of eccentric…. these things happen. Frosty Knickers is your new stage name. As Mago has already beaten me to the “frosty knickers”, all I have to say is “Bananas”! P.S. Sorry for the Cormorant-hogging. I am breeding hedgehogs in the garden, Mr Device, they have set up home in a discarded hedge. With trimmings. I will save my blurry cormorant for Christmas, when there will be extra trimmings and brussel sprouts. PS I just inadvertently clicked “Like” before I found the comments, which is all very bloody F***book, isn’t it? PPS what on earth is that scary thing poking out of a bottle on the left hand side of the page? Made me jump! Definitely a self-help manual, Jon!! It is about living a life patiently, and keeping your head above the rising tide…. by standing on a pole with your arms outstretched. Well! Pooh-bah and bungalow! Gazumped TWICE on the “frosty knickers” response. But such a sweet little Hodge, snuffling his(her?) way around. I think it calls for cake! Dinah, I think I’m the only one who hasn’t posted a picture of cake!! I will do so within the next couple of weeks. Yes, I am very fond of the hedgehog… fearless wee things. Please no sitting on the bakery products, Mistress!! Is it better to keep ones knickers in the salad compartment along with the mouldy Aldi onions, or in the dairy box with the mouldy Aldi butter? What is this ‘Aldi’ of which you speak, Mr Nikos?? Have you forgotten my legendary fridge post already…. granted it was a few years back and on a different blog, but surely it was memorable?? I will find a link to show you what to store in a fridge….. and perhaps I should do a recap…. Oh yes please Ms Scarlet, and could you assist in sorting out my nuts and bolts too? Frosty Knickers are just what is needed in a Glorious January! Keep them in the freezer compartment, Scarlet, far away from moldy anything. I recall both the bottle and Smeg blog posts! If you keep this up, you will just need to hit the ‘repeat’ button on your blog to do all the recaps. Oh please post again, Ponita! I miss blogging and bloggers. Blogging feels so much more…. civilised….than other forums. Not 100% with you on reality shows, Bill. I am besotted with Googlebox – I guess it’s not a proper reality show though. Do you have a US version? I followed the link. Sounds a bit interesting. My problem with reality TV is that typically it is not real. It is often scripted. I don’t follow reality TV much at all here. But I do know that con artist Donald the Trump made money on reality TV. Those hedgehogs are so cute! Are they dangerous like the Killer Rabbit of Caerbannog? Frosty Knickers sounds like the title of an Infomaniac Book Of The Month Club selection! I will have to Google the rabbit, Mr Lax! Hedgehogs are lovely…. and allow you to get nice and close for a photo opportunity. The downside is that they play host to a good many fleas. It’s the title of Miss Scarlet’s memoir, Mr. Lax. So many pamphlets to publish…. Damn! Can’t make the link work. Just cut and paste it. Oh dear, Dinah, this Youtube clip is unavailable in the UK…. but I do have a vague recollection of Monroe’s character storing undies in the ice box – I will see if I can find a version that Youtube will let me watch. Yes… the random placement of comments on this post has had me scrolling in an incoherent fashion all day. Keeps me on my fingers I suppose. Shouldn’t grumble. A push is as good as a shove to a blind man on a tow path. This Just In: The Secret Life of Hedgehogs. You can’t do that with a Cormorant! Thank you, Mr Lax. I may have to purchase that book. Anything that combines miniatures with adorable animals is irresistible to me. I know… it’s a bit too cute to resist. There will probably be a calendar out at Christmas…. and Christmas cards. Maybe I can train my hedgehog to do all these things? To be honest, I was expecting a hedgehog on a chair. The hedgehog is still in training for this event and has yet to master reading the book that is already on the chair. Funny but I always think hedgehogs ought to be blue & super speedy–all thanks to Sonic the hedgehog video games…These naturally brown ones look quite charming…though the spines would give me pause before attempting to pet them. 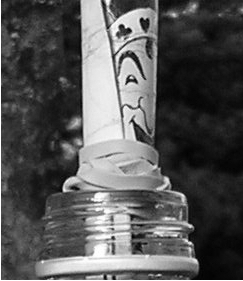 The writings look beautiful as always. Oh Mr Swings, they are not fond of being handled, so it’s fine to admire them from a distance. Do you remember Mrs Tiggy-Winkle – Sonic the hedgehog’s Great Great Great Grandmother??? what came first the hedge or the hog? If I stare at that sentence long enough eventually a joke will appear. Since they dig burrows, why do they always look so clean? I would not make for a clean hedgehog. Well, Bill, I have been researching hedgehogs and they are very clean – no dander! And their fleas are species specific. 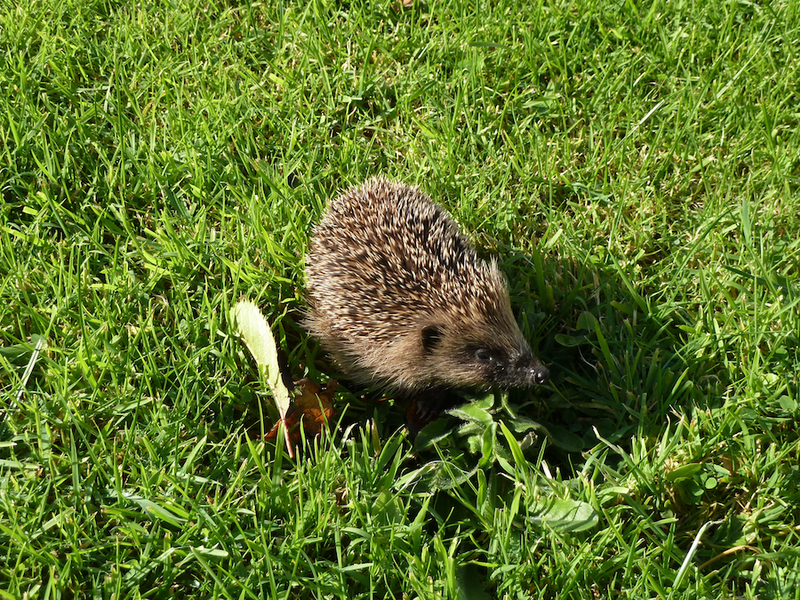 BUT, they are not supposed to be wandering around in gardens during daylight hours…. so this one must have had its nest disturbed. He/she looked happy enough, and hopefully found somewhere for a snooze. There are plenty of hedges here! I assume you like them in your garden. Now raccoons here are cute but I can’t stand them in my garden since they destroy things like porches, attics, etc. Maybe these cute hedgehogs are nicer to the property owners. I do like the hedgehogs, Bill, they are harmless…. we have nothing like raccoons here!! They do look cute! The closest we have to destructive critters are squirrels…. they can cause havoc if they nest in the roof, but mostly our wildlife is tame by comparison. So…what do you mean? Like, this is an actual hedgehog from your backyard or you visited a zoo and saw him? You spotted it in its actual habitat? I didn’t know that was something a person could do. Indeed, Monsieur Pain, in the garden!!! But as I said to Bill, hedgehogs are supposed to be nocturnal…. so this should be a rare sighting. I live in a rural area with lots of farming going on so I suppose they will suffer the occasional disturbance. Do you not have hedgehogs in the US???? Do you not read Beatrix Potter???? We have moles, which are far less literary. There are no fictional rodents in my yard. Does your yard have cobbles….? I always think of Coronation Street when my US chums talk about their yards!! Confess – your Igel made it on the cover of Igel Bulletin ! Hedgehogs have the right idea – do everything at a sedate, leisurely pace and leave the frantic rushing around to those neurotic humans. Frosted knickers? When I were growing up, it were that cold it were frost with everything. Frosted condoms were no joke, I can tell you. But…. Erm….frosted condoms must surely be the ultimate in contraception, Nick! Frosted condoms – Why Jack Frost what would Frosty the snowman do? Bill – he would use a carrot… a frozen carrot. I had to Google, Mr Lax! No, we don’t have Jackalopes…. but I am imagining the possibility of Squadgers… they could be a thing. Hedgehog! Why can’t we just share our hedges? You make a good point, Mr Squirrel…. Princess…. the Echidna makes the hedgehog look like a teddy bear! Hedgehog prints…..? Now there’s a thought, Mr Ducks! I am well, Mr Ducks…. bit dazed and confused, bit puzzled that Strictly Come Dancing is about to start again, which means that we are starting the run up to Christmas. What a year. I’ve broken all my blogging promises. I stay shtum now. Ms Roses – So have I!!! I can’t even remember how many I’ve made!! Oh well. We must be the ‘muddle through’ sort of people – i.e. not good at sticking to plans!! As per your last post, surely there are millions upon besquillions to be made from immortalising the truly ridiculous or offensive in calligraphy, Scarlet. Or is my dawning realisation laughably late to the party, and you are in fact blogging from your offensively and ridiculously large chateau in the South of France as we speak? Ssshhhhh…. Ms Tara…. we must make no mention of the large chateau in the South of France…. I’ve got a sudden craving for cheese and pineapple on sticks. Indeed, Ms Mitzi, but first let me put on the Demis Roussos (I have spelt his name incorrectly but I am too lazy to check) cassette and get the Artic Roll on ice. I’m haunted by knickers just now. An old chum had a hissy fit because she didn’t like her knickers just as we were taking her out for a Birthday lunch. All was well in the end. From one side of the screen to the other side of the screen – da kann man ja einen Drehwurm kriegen ! And does it look a bit Alegreya ? I have been having issues with grey rectangles…. it was supposed to be a smiley face!! Problems seemingly wordpress related – I just tested smiley faces in my comments & the result is an rectangle and a black blob. To make things more complicated : I just used another computer that runs windows 10 and the google chrome browser – and all the smileys are smileys ! Are you gilding a lily ? Hey – I LIKE this surroundings ! Clear font, well readable, links well recognisable, good contrast. On my screen I have nothing to change. This is The Eighties theme now….but… still things I’m not sure about. I pay so I can tinker, Mr Mags…. also why I only have one blog now!! I was halfway through my swim a little earlier, and I suddenly remembered that I hadn’t visited your blog to see the amazing thing of which you had hinted at. So, now back at home, and an hour later, I have suddenly remembered again (how quickly I forget things) and here I am. I like the new theme – everything is so big and clear – but where is the thing? Are you gilding a cormorant, Ms Scarlet? Is that why this is taking so long? Apologies, Mr Devine, I have been called upon to do some emergency calligraphy… but I will do my best to slap my post up before the weekend is up. Does The Book of Shadows mean anything to you? Better not mumble the text while you are doing what needs to be done. Hang on. The Host is telling me not to be such an old stick-in-the-mud! How did you know I was mumbling…..???? No….. this was an old ancient version that I saw….. but I might be giving the game away…..